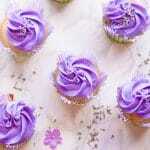 These lavender cupcakes are so fun and easy to make. Delicious lavender-infused cupcakes are topped with a beautiful lavender buttercream frosting. They're so simple - yet pretty enough for teatime. In a small bowl, mix together the wet ingredients (butter, egg whites, milk) for the cupcake batter. In a separate larger bowl, mix together the dry ingredients for the cupcake batter (flour, sugar, baking powder, lavender, salt). Mix together the dry and wet ingredients to form the cupcake batter. Use an electric mixer to make this easier, if you have one. Spray a cupcake tin with cooking spray. Pour batter into cupcake tins. Bake for 12-18 minutes, until a sharp knife inserted into a cupcake comes out clean. Before decorating cupcakes, ensure they are cool. Using an electric mixer, start beating butter, sugar, and milk on medium speed. Gradually increase the speed to high, and you will see your buttercream starting to take form. It is ready once it forms still peaks. Color buttercream with purple gel food coloring, then fold in honey. Using a piping bag, frost each cupcake. Top with dried lavender and serve. For a smoother cupcake batter, you can process the dried lavender in a food processor before using. This will grind it into a smooth powder.